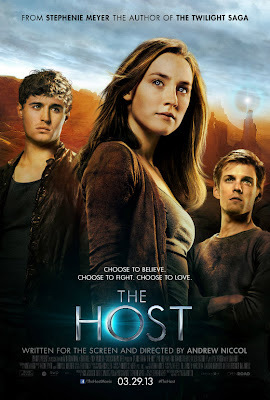 First and foremost, I loved The Host... as a book. It was captivating, thrilling, and above all romantic. As a movie... not so much. The real key to a great Book to Film Adaptation lies in the film's success at concentrating and magnifying the true feelings that readers have when they read the book. It’s having the ability to transmit central messages of the book in meaningful ways, as well as dealing with the time constrained world of cinema. 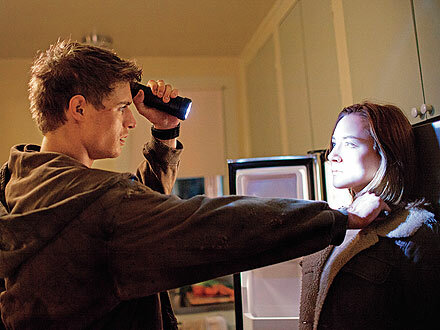 While I felt they followed the book really well, I also felt it was lacking in so many ways. Director Andrew Niccol takes the reigns here, adapting the story that goes a little like this: Aliens (called souls) seize control of human bodies. They are peaceful, respectful and extremely polite. An excellent addition to the neighborhood, except for the whole body-snatching business. When souls are placed into human bodies that said person's mind withers away, but not in the case of our heroin, Melanie Stryder (Saoirse Ronan), who refuses to give Wanda (the soul), full mind-power. Soon after possession, Wanda, through Melanie's memories, develops a fondness for her friends and family, and against her will sets out to find Melanie's posse. All of whom are hidden away in a mountain deep in the desert. Melanie's uncle Jeb (William Hurt) and his followers (including Melanie's one true love, Jared (Max Irons) slowly but surly accept Wanda as a friend and family member. Later on Wanda entertains the advances of another young man, Ian (Jake Abel), who apparently finds alien-possessed girls hot. Watching Ronan having arguments with her inner voice was just trash cinema. I could not get over how awful those scenes were. The movie felt shallow and boring. The pacing was poor, the structure was awkward, and even though Ronan is a good actress, I would have liked to have seen Camilla Belle in the lead instead. All in all, I felt like a Sophomore did a Senior job. The reason why? The items as listed above tend to be licensed with a group associated with specialists fake rolex that can handle making clear any kind of ambiguities that may seem. Just in case the maker includes a dropped as well as lost report, then your hublot replica tend to be examined to make certain their own background is actually thoroughly clean. Just about all wrist watches provided have been in an excellent general situation. Usually the actual cartier replica shown on the web site tend to be the fact and also the excellent high quality pictures would be the types which could explain any sort of question associated with new york state from the cartier replica. Obviously, refunds tend to be usually feasible just in case purchasers aren't enthusiastic about exactly what these people obtain. Purchasers be able to to surf in the comfort and ease of the home or even they are able to go to the utilized replica watches store face-to-face. On the internet there are many inventories that will help site visitors flick through the actual webpages and gives the mandatory info 1 may need to make the actual buy.